The denouement of the 2014 FA Women’s Super League was a dramatic one. 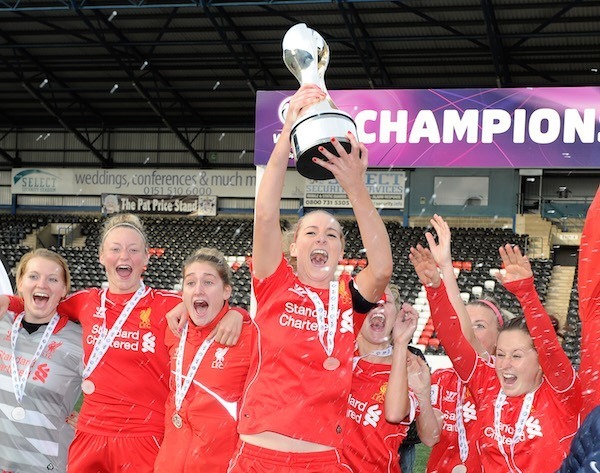 Liverpool – in third place as the last day of the season began – shocked Chelsea and Manchester City to cling on to their title courtesy of a 3-0 win against Bristol Academy with goals from England trio Lucy Bronze, Natasha Dowie and Fara Williams. Davison has since completed a move to Chelsea, giving her the opportunity to work with Emma Hayes, a coach she admires hugely. 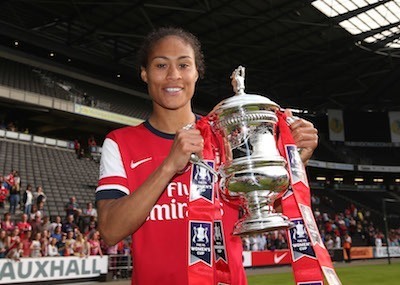 Davison began her career at Arsenal, a club of which she is still very fond, moving away to play in America before the WPS league’s collapse in 2012, and returning to Meadow Park soon afterwards before her switch to Liverpool for the 2014 season. In the past two years, Arsenal’s former glories have certainly faded a little as key and long-serving players such as Davison, Katie Chapman, Ciara Grant and Jayne Ludlow have left. The once-dominant Arsenal reclaimed some semblance of dignity by winning the 2014 FA Women’s Cup, but failed to make it a double with an uncharacteristically limp display against Manchester City in the Continental Cup final, meaning they lost their grip on that particular trophy for the first time ever. Defender Casey Stoney is sure that they will be more competitive when the 2015 season kicks off at the end of March. Winger Rachel Yankey thinks that new manager Pedro Martinez Losa’s regime promises future success after the instability of 2014, with coach Shelley Kerr’s mid-season departure. One of the problems with the WSL’s scheduling is the necessity of a mid-season break to allow for international tournaments. In 2015, many of the players will also have half an eye on Canada, where the World Cup takes place in June. The WSL is, then, very much a test of a squad’s strength in depth and stamina, and all the clubs across the two divisions have tweaked their personnel during the close season. As for the WSL1 champions? The Women’s Super League begins on March 18, 2015 and you can find fixtures, tables, ticket information and much more here.